For this project our client wanted a decked area of 3m x 4.2m and the rest of the area was to be laid with decorative stone. As requested by our customer we set about installing the framework for the decking directly onto the existing ground. They did not want the ground cleared but instead opted to use a good quality weed suppressant to kill off the vegetation and stop any regrowth. 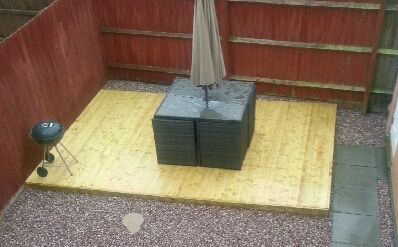 After installing the framework for the decking and ensuring it was level, we laid the weed suppressing fabric before fixing the decking boards into place to complete the decked area. The weed suppressant was then laid to the remaining area. Care was taken to ensure the entire area was covered and the weed suppressing fabric was securely anchored into place. Next came the laying of the Cheshire Pink stone, a good quantity was laid to ensure good coverage. Four shaped stepping stones were set in place, these were in a colour to complement the cheshire pink stone, and added the finishing touch. Another satisfied customer, we were able to achieve the garden that they desired both on time and in budget. This project was completed by two people in just two days!